(autoinsidernews) - Ford unveiled its 2008 F-Series Super Duty pickups, including the F-250, at the State Fair of Texas last month. 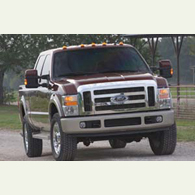 The 2008 Super Duty trucks are an important percentage of the automaker's F-Series sales. The bigger, bolder 2008 Super Duty trucks feature a new 6.4L Power Stroke diesel delivering 350-hp and whopping 650 lb.-ft. of torque. Despite the increase challenge from GM's new trucks and Toyota's new Tundra, the new 2008 F-Series Super Duty pickups should easily keep Ford at the top of the truck sales charts, reports Trend.